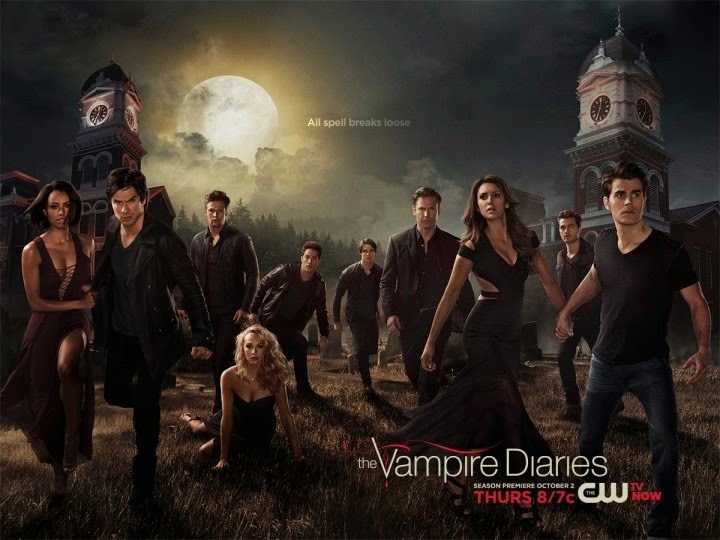 The Vampire Diaries Season 6 Episode 10 "Christmas Through Your Eyes" MIDSEASON FINALE!! Let me start off by saying that the Salvatore Brothers are probably the ones that will be having a great Christmas in comparison to the other characters on this show. Kai will be the one really enjoying himself the most out of everyone though. I guess I'll just hop into the recap of what happened on tonight's TVD episode. but apparently the family bonding of MalaJo is. Alaric establishes Jolaric as he claims Jo as his girlfriend with an "Ohh.. uhh..." A girl is rolled into the ER with fatal wounds. Jo asks if she can tell her what happened. The girl barely utters anything while she's in terror as she sees the guy who covered her in blood behind Jo. IT's actually Kai who is dramatically covered in blood. He grabs Jo, tells he wassup, and gives her a tranquilizer to the neck. We flashback to a few Christmas's ago. Elena and Bonnie are at the decorating ceremony for Mystic Falls. In past, but present time we see Bonnie talking to the sky declaring that it's not May 1994 and that it's the day of the year for the Christmas tree decorating ceremony. I have to feel bad for Bonnie as she drags a huge tree to the middle of the parking lot, in the same place as where the Mystic Falls' tree was placed. "What are you doing here Stefan? Can you not be here right now?.." She hits Stefan with the signature Caroline attitude as she picks the little lights to decorate with. We see Elena reading through Alaric's books, attempting to find something to help Bonnie. Damon is taking a vampire nap on top of one of Alaric's books. He wakes up to Elena watching him sleep and drool in one of Alaric's books. They can't find anything that looks like the ascendant. Damon persists to keep looking. Elena continues staring at Damon and thanks him for doing everything he's doing to help bring back Bonnie. Alaric calls Elena and asks if she's seen Jo. They realize that no one has seen her or heard from her since the night before in the ER. They assume that Kai has her. Tyler tells the twins (Liv and Luke) they need to let Kai keep Jo. He says that they need to let Kai merge with Jo, so that one of them (mainly Luke) won't have to die. Damon calls Matt and he hasn't seen or heard of Kai... Jeremy and Matt get their gear together to go on a psycho killer vampire hunt for Enzo. The discussion of where Jo hid her magic knife comes up between two different conversations between Damon/Elena/Alaric and Tyler/Luke/Liv, but no one knows where it is. Damon announces in the private conversation between him, Elena, and Alaric that he hid it and has it. Elena says Kai wouldn't be able to find magic on his own. Meanwhile, Liv decides that they should let Kai take Jo's magic... They find out from Tyler that Kai wants them to do a locator spell to find Jo's knife. I suppose Liv, Luke, and Tyler care not what happens to everyone else. Damon believes that he still has the knife in his hiding spot behind a frame and goes to get it to show to Elena and Alaric, but it's gone. We see that Kai has it and he has Jo in a small cemetery building. "We maybe decorating together, but I still unfriend you..."
"I'm going to stab you, sis and if I don't get what I want I'm going to slit your throat, baby sis." "Everyone is friendly when they hang Christmas lights, but it doesn't really make anything better." She somewhat tells Stefan to leave. Caroline's mom comes back with hot cocoa. She begins to faint, but Stefan catches her. She ends up collapsing. Kai draws a line to make sure he knows where the magic line of Mystic Falls ends.. He bring the twins into the building where Jo is. He begins stabbing Jo in the arm with her knife, trying to combine her with the knife's magic. Luke leaves because he doesn't want to see Jo hurt. Kai stops stabbing her in the arm. Jo tells him that the only way she can merge with her powers is if she chooses to. She then explains to him that it would be ironic if she bled to death before she merged her powers from the knife with her body. Kai stares at her with frustration and then tells Liv to figure out how to make her merge or he'll slit her throat if it's not done by the time he gets back. He leaves. "You must think I'm stupid." Tyler and Damon are talking on the phone... Tyler's like..
"I did what I had to do to save my girlfriend and her brother...even though I don't really care about him.... or her bigger sister.."
Damon: Sooo you do know that if Jo is dead Kai is still going to kill everyone.... right? "What's to stop Kai from killing you like he killed your other siblings???" Luke stands there looking at him in silence. Caroline is at the hospital with Elena as they wait to see what's going on with Sheriff Forbes. They don't know why she collapsed, but she's sedated at the moment. Caroline tells Elena that she loves how Damon has always been there for her through everything. I'm going to assume that Caroline wishes that Stefan was always there for her like that. Enzo shows up in the place where he was tortured by Tripp, which is the same place where he locked up Monique...since he snapped her neck last week in hopes of finding out what she knew about Stefan's secret. Matt is there instead of Monique and Enzo asks why is he there. He asks where is Monique and Matt tells him that he let her go. He tells him that he got all of the information from her about what she knew. Enzo asks him why is he trying to help him. Matt then tell him that he wants to help him get the information about Stefan's secret just because he wants Enzo to leave town. He gives him a big file that seems as though its full of info. Enzo opens it and see that all of the pages are blank. Matt hits him with a devilish smile. Jeremy shows up with his arrows and shoots Enzo, but he catches it. Matt tries to stab Enzo, but he stops him and begins choking him. With Enzo being caught off guard, Jeremy shoots Enzo in the back and Matt stabs his neck. Enzo drops. Vampire blood can't save the one person who knew everything that was going on and chose to accept it all. "I will take on Kai, so that we all can Liv." Stefan and Elena compel Sheriff Forbes doctor to find out what's going on with her health. They find out that she has a tumor that she can't survive. She first found out when she went to the doctor after her altercation with Tripp when his vampire hunters kidnapped her to get Tripp back when Enzo kidnapped him, since they knew Caroline was a vampire. Matt tells Jeremy that he wants to torture Enzo... Jeremy is just like we should kill him and move on. Jeremy explains to him that if he's willing to torture a vampire for killing... how can he even overlook Stefan or Elena? He tells him that he's going down a dangerous road that will get him killed if he tries it and he leaves Matt with Enzo's body. As Liv uses her powers to heal Jo's arm, Jo tells her that she needs to just defeat Kai.... So that they all can run. Liv tells her that she has accomplished a lot with her magic, including saving tons of lives. She tells Jo that she should believe in herself and that she can take on Kai. She believes that Jo could take her place as the head of the Gemini coven. As she gets up from fixing Jo's wound, Kai grabs her and begins draining her power... attempting to kill her in front of Jo to convince her to absorb her magic back into her body. Jo complies to save her little sister. Kai is satisfied and begins walking outside, completely aware that someone else is near.. Damon smacks him a few feet over. Kai uses his powers to throw Damon onto the other side of the magic border. Damon's face begins to burn. Kai runs to the no magic side so that Damon can't touch him. Damon runs to the magical side. Alaric comes up behind Kai, grabs him around the neck, and points a gun to his head.. Damon tells him to kill him. Jo runs out and tells him to not kill him because she doesn't want one of the twins to have to die. As Liv is struggling to...well live, she hears her. Damon says kill him, again. Jo declares that she will be strong enough... to kill Malachi. Alaric smacks Kai in the head with the gun. "How are we going to tell her?" "He told me everything I needed to know." "Do you honestly believe that? Kai is going to take his years of being trapped out on the coven and then on everyone else." Liv declares that she would rather be selfish than be a martyr... Luke grabs his stuff and says that the deaths that follow this event will be on their hands. Liv's face turns into pure guilt. Stefan and Elena discuss Caroline's mom's tumor. They don't know how to break it to Caroline. Elena doesn't want Caroline to find out by compelling the doctor and asking what's wrong with her... like they did. Stefan decides that he should be the one to tell her since he hasn't really been there for her lately. Alaric and Jo share a discussion and a kiss as she tells him that she will grow stronger to defeat him. She's also glad that he doesn't find any of this odd. Kai hides behind a tombstone that Alaric chained him near. Damon throws rocks at his head as they talk. Kai asks Damon about the magic that is covering the entire town. Damon unknowingly entertains his conversation as he hurls rocks at his head. Malachi begins thinking. We see Kai dig his hands into the earth as he is chained. His hands glow with red as he chants silently. Damon continues trying to hit Kai with rocks to kill him. Alaric tells him that he needs to stop since they need him alive... so Jo can have the honor of killing him. Damon tells him that Kai's the reason Bonnie isn't back. So of course, he's mad... and he throws a rock through Alaric's tire. He tells him he needs to get it changed... Again... another tire death in this show. We were happy then... but the magic has returned. Bonnie begins to get ready to light her Christmas tree, alone. The show flashes back to Caroline, Bonnie, and Elena smiling happily together during the ceremony. In the present... Caroline doesn't know what's happening with her mom and believes that the doctor is going to run more tests.. Stefan tells her that they need to talk about what's going with her mom. Damon calls Elena, but the service is horrible because of the change in the weather. The wind is blowing heavily and the trees are shaking frantically. In downtown Mystic Falls Jeremy is at the Christmas Ceremony. As they are pushing the extension cords together to light the tree it begins flickering. Jeremy watches. Kai's hands continue lighting up red. Damon realizes that Kai isn't talking and since he's known him..he has never stopped talking. He realizes that he is chanting. Alaric and Damon see that he isn't chained. Kai stands up and Damon realizes that he sucked all of the Traveler's magic used to put the magical barrier on the town up. Kai throws Alaric into a tree. Damon walks across the borderline. Alaric asks how isn't he dead...and tells him that the magical borderline is gone. Matt drives to the other side of the Mystic Falls magic border to kill Enzo the way Tripp was originally killing vampires. Enzo begins to shake, spitting up blood and whatnot.. Matt stops the car and goes to open the trunk of the truck. He grabs Enzo's arm to flip him over, but he isn't dead. Enzo grabs Matt's throat. What do you wish to have for Christmas? Enzo sits on the edge of the truck as Matt is sitting inside of the back. Enzo tells Matt that they aren't enemies.... Enzo explains that he is jealous of Stefan's life. Stefan has family and friends who love him. He has a great girl who he ignores and he tells Matt that he's going to help him take everything away from him. Damon walks through his front door while talking to Elena on the phone. He knows that Elena is down, so he tells her to come over so that they can talk about their day and he offers to cook her dinner. She agrees to see him. Caroline tries to come up with ways to save her mother once Stefan tells her what's going on. Stefan tells Caroline that vampire blood can't cure tumors. I think that it is mainly because it is natural and not a result of magic. He also tells her that the tumor is growing too fast and the doctors won't be able to give her chemo. They cant help her. Caroline begins to cry. Stefan offers his shoulder for her to cry on. She tries to lean away from him, but eventually she begins to cry on his shoulder. He holds her. Bonnie lights her tree on fire at the same time in reality with Jeremy standing in front of the ceremonial Christmas tree. Jeremy says out loud that everyone misses her..
And he walks away. In the other reality, Bonnie cries and walks away. Caroline holds her mom's hand as she sleeps in the hospital bed. Stefan rolls up to the Salvatore house in Damon's old car from 1994.... the same car that him and Elena blew up in when they rode into the bar last season to get rid of the Travelers. Stefan tells Damon that it's a gift for him since he had 4 months to fix it when he was in the other reality with Bonnie. Stefan heads up to his room and we see both Salvatore brothers share a smile of happiness and contentment. Elena walks up to Damon's door and sees a mistletoe. She knocks on the door and Damon opens it. She tells him that the mistletoe was clever. Damon seems as though he is staring at her and continues to say hello. Apparently Damon can't see Elena. She's invisible. Kai shows up behind her and says he put a cloaking spell on her and him. He smiles at her. Then he smacks her in the face with a socket wrench and she drops. Thoughts about The Vampire Diaries Season 6 Episode 10 "Christmas Through Your Eyes"
If Jo knew Kai was back, why didn't she attempt to protect herself in some sort of way? Why didn't the twins try to protect themselves? Are there not any spells they could use to at least let them know when someone is within 40 feet of them? I just want Alaric to be happy. Him and Jo can get married and have babies. Also... does no one get pregnant on this show? I've seen one baby in this entire series, but I guess babies aren't ideal for a show revolving around blood and magic. Luke is apparently the moral one... because Liv gave no f***s. She was just like I'm going to sell my sister out because I'm not trying to kill my twin...even though everyone else in the world may die. Kai is your problem. Also... is Tyler just trying to get laid? I'm not even going to lie to you guys.. Caroline has been annoying me with this whole Stefan thing. I hope they aren't going to use this issue with her mom as a way to force them into a relationship... People always end up bonding when a tragedy happens or when something doesn't go their way on this show. I hope Enzo doesn't end up killing Matt... I mean, can Matt catch a break for once? Bonnie and Jeremy are everything. Their bond. Their love... IS EVERYTHING! Elena is coming around to loving Damon...or at least liking him. I actually kind of like their relationship now. It's so fresh and new. It seems as though the possibilities are endless. I'm glad that Stefan and Damon seem to finally be happy... I suppose I'm more so happy for Stefan because he doesn't really know what he wants to do with his life yet and he hasn't really had a chance to just relax... Damon on the other hand has a big shot at making things happen with Elena right now. What's the Gemini Twins father doing? What is their coven doing? Kai just absorbed the Traveler's town spell in less than an hour? Okay... I guess that's one way to remove the spell and get the town back. There's apparently no overwhelming this guy. How is Jo going to become stronger than Kai when he absorbed a town's worth of energy? Where was Monique if she was transitioning? Who was helping her live? And can I just say that Kai seems like he just needs some love....but I guess that's not going to happen. Enzo is going to tell Damon that Sara (Salvatore girl) is alive. However, it is possible that the writers could make Stefan sleep with Caroline. I'm going to be upset if that happens. Maybe Luke is more powerful than we let on.... I just feel like he's going to surprise us. Kai definitely wants Elena... He's going to be attracted to her, but I'm wondering if Elena is going to be leverage against Damon or does Elena still have some sort of doppleganger importance or is that whole thing irrelevant now? Maybe Kai just wants some love. Jo is going to save Bonnie... Maybe Jo can bring Bonnie back and she can help stop Kai. Jo: I'm trying to destroy Kai.. I can do it. Kai: No you can't. I'm going to kill you sister. "You thought you had me Kai. You thought you could keep me from coming back to life?? I'm going to kill you sucka!!" and then Kai will be gone because of girl power. Then everyone will live happily ever after...except Enzo because he'll be still trying to ruin Stefan's life...and possibly Caroline because a lot is going on with her right now. Anyway, what did you guys think of this episode? What were your thoughts? What do you think Malachi's intentions are with Elena? I guess I'll be watching reruns until then.